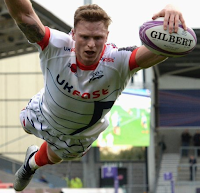 TOTAL FLANKER...a rugby blog: Time for Chris Ashton to grow up? Time for Chris Ashton to grow up? Predictably enough, Chris Ashton scored a hat-trick of tries at the weekend on his competitive debut for Sale Sharks as they sealed a 34-13 win against Connacht in the European Challenge Cup. Equally predictably the so-called "Ash-Splash" is still very much in evidence. And I still hate it. I don't suppose there is any chance of Ashton growing up any time soon. England Rugby "not arrogant enough"
Is more in fact less for Premiership Rugby?